Dandruff is one of the most common ailments affecting the scalp. Dandruff is nothing but excessive scaling of dead cells of the skin of the scalp. As you are aware, body undergoes constant but gradual renewal every 24 hours. However, when it is much faster renewal of the skin, it becomes visible in the form of scales, which we call dandruff. Homeopathic treatment aims are treating dandruff in totality. In other words, it treats the underlying cause of dandruff and hence helps preventing recurrence of dandruff. · Dandruff is often found to be is mostly seasonal. Some patients find it most severe during winter and mildest during summer. · Though Dandruff is called as Dry Scalp but the people with oily scalp tend to suffer the more. 1. When the hair is combed or brushed, or when the scalp is scratched, the scales from the scalp drop like snowflakes and settle on the eye brows, shoulders, and clothes. These scales occasionally appear as lumps or crusts on the scalp. 2. Itching is there and scalp may turn into red. 3. Often there is itching as well and the scalp may turn into red from scratching. 1. Pimples may pop out: Due to dandruff pimples may pop out on your skin. If the white flakes fall on your T- zone region, the facial area which is more prone to pimple then pimples many come out in that region. 2. Problem of pigmentation: The pimples leave behind dark spots all over your skin leading to the embarrassing problem of pigmentation. Dandruff makes the condition even bad. 3. Chest rashes may appear: If your dandruff becomes uncontrollable then it keeps falling all over your body. This may lead to the break out of chest rashes. 4. Acne: Acne is another distressing problem that may be the result of dandruff. This also promotes the break out of pimples and red rashes on your skin. 5. Facial rashes: Facial rashes may also appear in many cases. Rashes can be seen near the eyebrow or forehead region. In case of men beard rashes are also common. 6. Itchy scalp: Dandruff gives you an itchy scalp. This further makes the condition of dandruff worse and the skin of your scalp becomes scaly resulting in further problems. 7. Eczema and psoriases are unfavorably affected: Skin problems like eczema and psoriases become far worse due to dandruff. 8. Inflammation and redness: Dandruff may cause your facial skin to suffer from the problems of inflammation and redness. Even though this is such a common issue, there’s still heaps of MISLEADING CONCEPTIONS about dandruff. Fact: Sometimes flakes are only a consequence of dry skin on your scalp. While the difference between dryness and dandruff might be unclear to the common individual, medical experts do make a distinction between the two. If your flakes are relatively small and white, chances are you’re dealing with a dry scalp - dandruff flakes tend to be larger and yellowish in colour. Fact: Dandruff is not something that you can catch from someone else. The fungal bacteria that can lead to the appearance of dandruff are present on everybody’s scalp, which means all our scalps are naturally predisposed to the condition. Fact: While regular shampooing can help keep dandruff under control, this condition does not stem from a lack of hygiene—even the most diligent hair washers can find themselves suffering from it. This is because dandruff is caused by various components, which include a characteristic overproduction of hair oil or an excess of parasitic microorganisms that live normally on our scalps. Fact: It's true that your scalp is the most widely recognised spot to experience dandruff, yet it's by all account not the only possibility. A few individuals additionally observe that areas such as the eyebrows, ears, and around the nose are inclined to flaking too. Fact: Hair fall is at some point connected with dandruff and an irritated scalp; however, these conditions are not mutually exclusive. Hair fall is not brought about by dandruff, but rather might be prompted by the incessant need to scratch a bothersome scalp. When we scratch our heads, the activity causes breakage in the hair. The root cause of hair fall includes anxiety, diet and the overall health of your scalp. If you wish to discuss about any specific problem, you can consult a Dermatologist. 1. Avoid frequent use of anti-dandruff shampoo, as such shampoos are habit forming. The day you stop using the shampoo, the dandruff resurfaces with more severity! 2. You are suggested to wash scalp with plane, warm water daily or use mild, baby shampoo. 3. 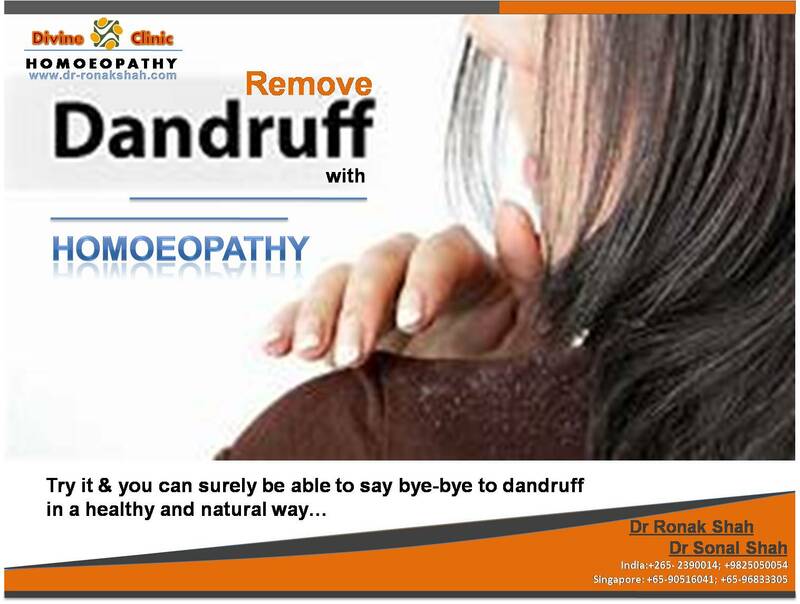 Homeopathic treatment is safe and very effective for dandruff, which is strongly recommended. Homeopathic medicines possibly uses for dandruff are geared towards altering the activity of the scalp tissue and therefore depress the abnormal multiplication of cells of the scalp called ‘stratum corneum’. Homeopathic medicines are unique in the respect that they can act as immune-modulators and address underlying immunological parameters while treating dandruff. Try all these and you can surely be able to say bye-bye to dandruff in a healthy and natural way.